The third book in the Dark Tower series is longer than the first two and moves at a much more languid pace. It took me awhile to get into it. But once I did I was up for the ride. Much like my favorite TV show LOST, The Dark Tower continues to layer itself in eery mystery. Just when you think you’ve got the gunslinger’s world all figured out, something bizarre shows up that throws all your theories out the window. In fact, I couldn’t help but draw similarities between the mysterious polar bear in the pilot of LOST and the giant, nuclear powered cyborg bear that ravages the forest in the beginning of The Waste Lands. Two crazy bears show up where they shouldn’t be. Coincidence? Probably, but I briefly entertained the notion that the LOST team had taken a page from King’s rulebook. What I love most about The Waste Lands is that King devised a way to bring back one of my favorite characters who had died in the first novel, the young boy Jake whom the gunslinger adopted as a surrogate son. Their relationship is a great one. The lone gunslinger without a family and children of his own and the young boy whose real father is a major putz. Pardon the cliche, but they complete one another. So I’m happy to see him back. Jake’s drawing — or his passage from his world into the world of the gunslinger’s — is a particularly intense sequence. One of the highlights of the book. As for the rest of the characters — Eddie, the recovering heroin addict, and Susannah, the legless black woman who’s true self only emerged at the end of the second book when her two, polar opposite split personalities merged into a single complimentary being — are back for book three. In fact, Roland has been training them with his guns and the ways of his ancestors, and Eddie and Susannah have become gunslingers in their own right. The four of them form a ka-tet, a group of people bound together by ka, the mythical force of the gunslinger’s world that draws him toward the Tower and dictates much of what happens along the way. Think of it as a mystical version of fate. 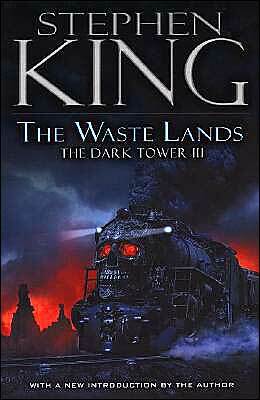 As for plot, The Waste Lands follows Roland and his crew as they continue toward the Dark Tower and cross a barren land long “passed on.” The villages and farms they find along the way are nothing more than dusty empty shells of a life long abandoned. Toward the end of the novel, the travelers reach the decaying city of Lud, and it’s here where The Waste Lands really takes flight. The last 150 pages zip along and kept me up at night. I was surprised, however, by the novel’s cliffhanger ending. Fans of the book who read it when it first came out had to wait six years for the fourth book and a resolution to book three. Fortunately for me, I’m coming late to the party. I didn’t have to wait at all. I’m deep in to book four already.